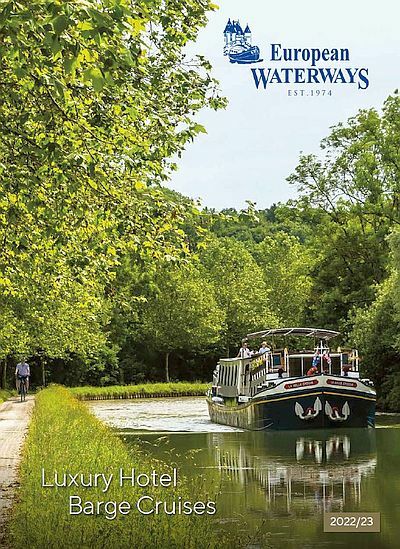 The beauty of a hotel barge cruise with European Waterways is that it can be as active – or as relaxing – as the guest wishes to make it. When some picture the ideal afternoon on board, they see themselves sitting out on the deck in the sunshine, watching the scenery drift by with a glass of chilled wine in hand. Others, however, get twitchy sitting still for too long. For the latter, we have an excellent solution: our barging and biking schemes. All of our hotel barges carry bicycles and bike helmets, which are available for anyone to use. During your cruise, all you have to do is ask a member of the crew to moor up or let you off at the next lock; then you can pedal along down the towpath and join the barge again at the next lock or village. It’s a great way for the livelier members of the group to get out, stretch their legs and see the canal or river from a different perspective. A number of our Classic Cruises – those aboard Anjodi, L’Impressionniste, La Belle Epoque, Renaissance, L’Art de Vivre, Panache, Finesse and Enchante – also offer a ‘Biking Plus’ option. With pre-prepared routes and maps (diligently researched by our team) of usually between 10 and 20 miles, guests can leave the towpath to explore the surrounding countryside and villages. If you get lost or stuck anywhere, just use the mobile phone provided and a member of the crew will find you in no time. Otherwise, you can simply meet the barge back where you started from, or a little way along the canal if previously agreed.